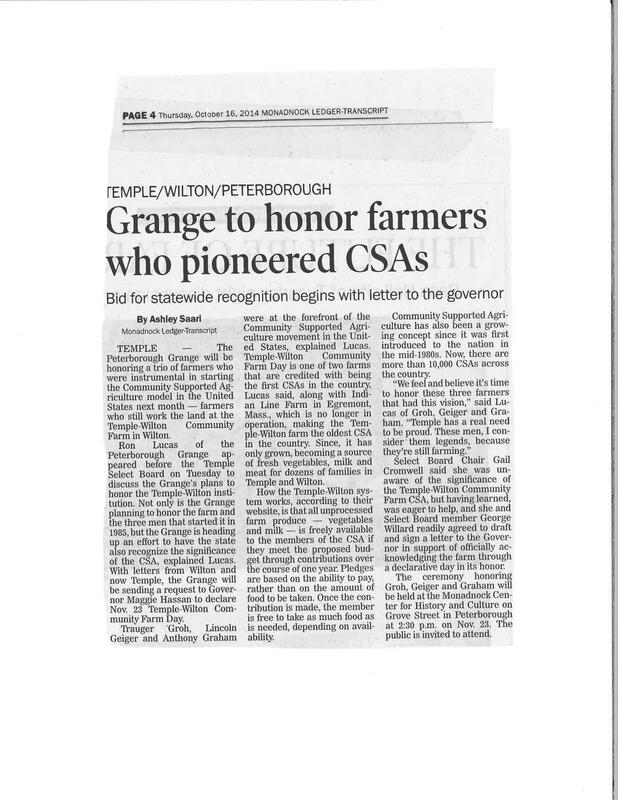 A thoughtful Grange chapter plans to honor three farmers who helped pioneer the Community Supported Agriculture (CSA) movement in the USA. 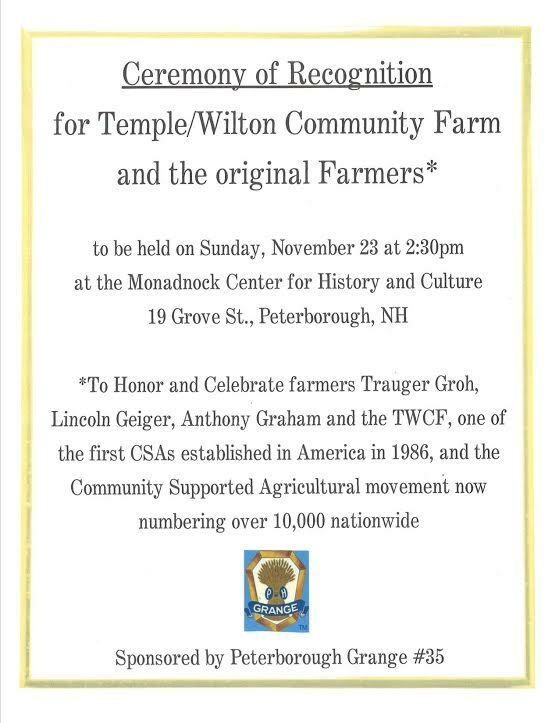 The event is set for Sunday, November 23 at the Monadnock Center for History and Culture, and it’s sponsored by the Peterborough Grange #35 in New Hampshire. CSA has multiplied from just two USA farms in the late 1980s to as many as 10,000 CSA farms now according to some estimates, with many thousands of other CSAs in nations all across the globe. 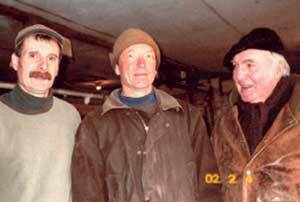 In the early era of CSA, in parallel with efforts at Indian Line Farm in Western Massachusetts, the three New Hampshire farmers — Trauger Groh, Lincoln Geiger and Anthony Graham — initiated the Temple Wilton Community Farm. Land for the Temple-Wilton Community farm is held in common through a legal trust. Pictured circa 2006 are founders Lincoln Geiger, Anthony Graham, and Trauger Groh. Their innovative CSA is still active and prosperous, and it continues to serve as a forward-looking model for successful community farms around the world– not simply because of the high quality of food they provide for member-owners of the farm, but also because of the profoundly sane environmental, educational, economic, social, and cultural benefits that have been developed as part of the model. In 1985-86 when the Temple-Wilton CSA was initiated, I was the farm and garden columnist for The Monadnock Ledger. The pioneering efforts of the local farmers naturally drew my interest. 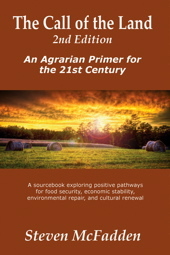 Eventually, with Trauger Groh, I co-authored Farms of Tomorrow (1990), and Farms of Tomorrow Revisited (2007) to explore in print what CSA held as potential. Later I authored a two-part history of CSA for Rodale’s New Farm magazine. I’m honored to have been invited to give a short keynote talk – by remote video — at the Grange-CSA event in New Hampshire, and to have an opportunity to try and place the creative efforts of these farmers in context. 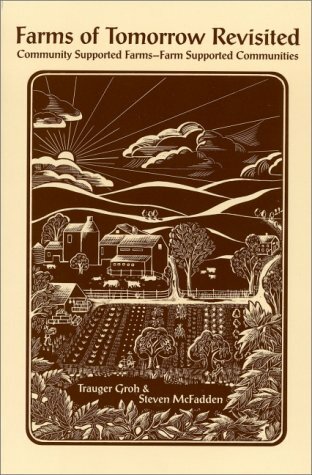 This keynote honoring event will continue a developing association between The Grange, which has deep historic roots in North America, and the emerging model of CSA community farms. 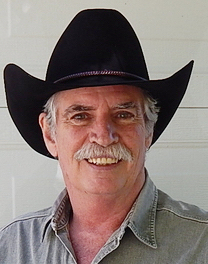 This entry was posted on Thursday, November 13th, 2014 at 3:17 PM and is filed under Call of the land, Earth, organic integrity, Responses to the call. You can follow any responses to this entry through the RSS 2.0 feed. You can leave a response, or trackback from your own site. Reblogged this on the irresistible fleet of bicycles.